Scott R. Miller, M.D., F.A.C.S. 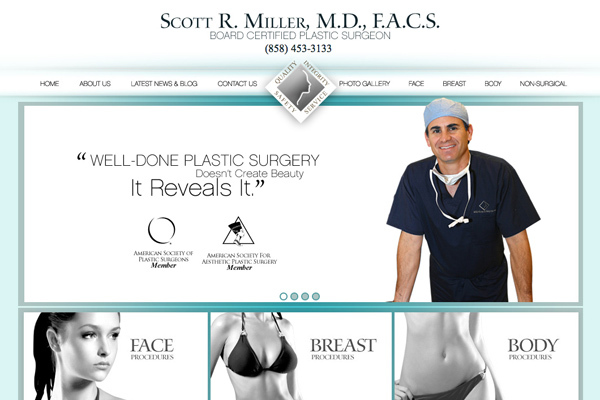 For his redesigned website dedicated to plastic surgery in San Diego, Dr. Scott Miller wanted to display his personable nature and extensive expertise with the highest level of tasteful professionalism. By combining an easily navigable structure with reader-friendly, conversational content, his new website creates a welcoming online experience that delivers thorough educational information and an interactive database to keep patients returning to its credible, reliable pages. Focused on cosmetic enhancement procedures ranging from liposuction to breast augmentation in San Diego, Dr. Miller’s website is refined simplicity with eye-catching design. With a drop-down menu and dynamic tabs, finding the right information for each patient’s particular aesthetic needs is as simple as the click of a button. Procedure pages include in-depth content detailing every step of the plastic surgery process from pre-operative consultation to recovery, with integrated videos to further enhance the educational experience. Rosemont Media’s skilled and experienced team of writers, developers, and graphic designers optimized Dr. Miller’s new site with search engine targeted compatibility and social media connectivity, ensuring it receives the visibility and attention his practice deserves. With 100% custom content and a unique medical website design, the site is fully equipped to make a lasting impression in the San Diego cosmetic enhancement market and improve his online patient interaction. For a better picture of the type of website Rosemont Media can create for you and your practice, visit millercosmeticsurgery.com.